Around this time of year, we tend to field a ton of questions about leather garments. As your friendly neighborhood garment care experts, we have no problems answering your questions… In fact, we kind of love it! And since we have recently received innumerable calls and questions recently regarding leather, we thought we would take a second to answer some of your most frequently asked leather questions. Q: Are there different types of leather? What kind should I choose? A: Leather can come from the hides of many different animals, although most leather today comes from cows. In terms of the type of leather itself though, there are (generally speaking), two types of leather. Because the strongest and most durable part of animal hides rests just below the fur (the top layer of the hide), how the leather is processed will affect its long-term durability. The grain pattern in this top-most area of the hide is tighter. 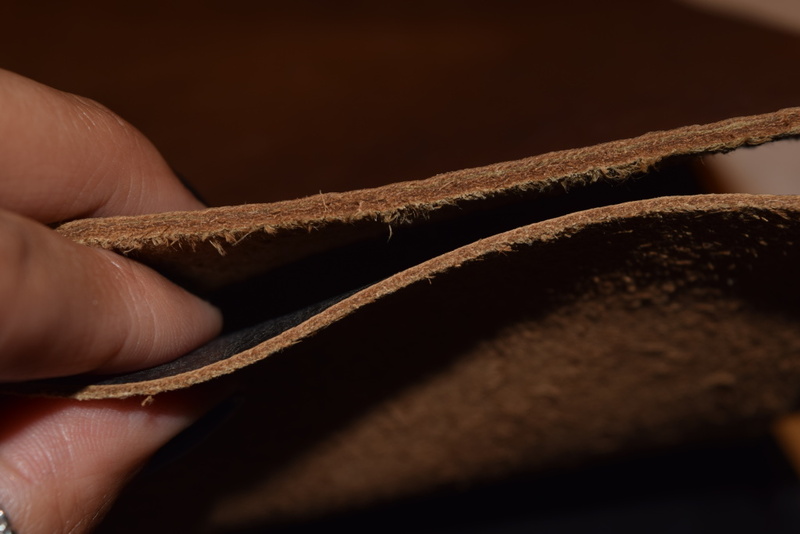 Leather made from this part of the hide is called “full-grain leather.” According to waskerd.com, and many other leading leather experts, full-grain leather is the strongest and most durable. Because full-grain leather retains the strongest part of the hide, the tight grain pattern is great at resisting moisture. As you handle full-grain leather, it will become more and more attractive as it develops a natural patina (that’s the sheen and marking that develop on leather from natural wear and use). The second type of leather is made when manufacturers sand or buff off the top layer of the leather, to remove imperfections. This is called “top-grain leather.” Top-grain leather is usually quite attractive, and the surface of the leather will be very uniform in appearance as the imperfections have been removed, and it is still good leather– although, it won’t be as durable as it’s more natural counterpart, the full-grain. The top is full-grain leather. You can see the extra layer of protection this offers. The bottom is top-grain leather; still nice, but not as durable as the thicker full-grain. Choosing the right kind of leather largely depends on what’s more important to the buyer– appearance, or durability? For light use and wear, or for items that you’re using to achieve a certain “look,” top-grain leather will usually suffice. Just beware, you can damage the leather over time if you don’t take very good care of it. If you’re going to use the article more heavily, full-grain leather will still be attractive, although more “natural” looking, and it will retain its durability. Full-grain leather is often quite a bit thicker/heavier, and it breathes less; so if you’re concerned about retaining too much heat, this is a factor to consider as well. Q: I paid a lot of money for my Italian leather coat… The best kind of leather comes from Italy, right? A: Yes, and no. It depends. Many clothing makers and designers boats that they only use Italian leather. And traditionally speaking, leather made in Italy (hundreds of years ago) was by far superior because of the incredibly arduous and strict tanning process that the Italians have used on their leather for centuries. So from this standpoint, the reputation of Italian leather being the “best” was well-deserved. However, times have changed; there is no aura surrounding Italy that somehow makes the leather inherently better than what is produced in other places. Many tanneries all over the world have adopted the same strict tanning process, producing high-quality leather that comes from all over the world, from makers with many different backgrounds. Don’t be fooled by high-end designers overcharging for items that brag about “Italian leather;” unless the quality of the entire item is greater, there is no reason to charge more, simply because of where the leather was produced. Q: Can leather be dry cleaned? Can I clean it at home? A: NO NO NO. And, kind of. Leather cannot be dry cleaned. Because it is a natural hide (i.e. comes from an animal), there are natural oils present in the garment that keep it supple and soft. Traditional washing with water or dry cleaning a leather item will dry out the leather, causing ugly cracks and dry, rough texture. You can wipe a leather garment clean by using a dry soft cloth to remove any dust and debris (especially that stuff that gets stuck in the seams of the garment). And there are many commercial brands that have created home cleaning products for leather items; however, for the best, most-thorough cleaning of leather, you should take it to a professional who can clean and deep-condition the leather, and restore it to its natural state. And for the record- Mulberrys uses cold-clean technology and naturally-occurring CO2 in our dry cleaning process, so we cannot dry clean leather. However, we partner with the absolute best leather cleaners in the city, and we would be more than happy to accept your leather items and return them to you looking like brand-new! Q: How do I choose a good professional leather cleaner? We hope this article has helped to answer some of your toughest leather questions! Have any other questions?? Submit your questions to wecare@mulberryscleaners.com or comment below! See you around the Berry patch!